Reid's D32 'Intermediates' proved to be very successful with passenger services as well as the goods services for which they were designed. With increasing train loads during the early 20th century, the North British Railway (NBR) required further locomotives, and it was natural that Reid would base these new locomotives on the successful D32s. The most notable innovation in the new locomotives, was the addition of a larger tender that was capable of carrying sufficient water for non-stop runs between Carlisle and Edinburgh. They were also built in two variants with different sized driving wheels. A mixed traffic variant had 6ft driving wheels and became NBR Class K (LNER D33). The express passenger variant was virtually identical but had larger 6ft 6in driving wheels. These became NBR Class J, and LNER D29. The D29s carried names taken from Sir Walter Scott's novels, and they quickly became known as the 'Scott Class'. The first batch of six was built in 1909 by the North British Locomotive Company, and they were followed by ten built in 1911 at Cowlairs. The Cowlairs batch was initially intended to be twelve locomotives, but the final two were built as superheated prototypes (see Class D30). In 1911, No. 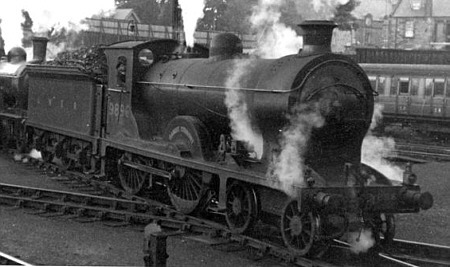 897 was experimentally fitted with a Phoenix smokebox superheater. The results were unsatisfactory, and the locomotive was returned to saturated running after a short period of time. The NBR also experimented with a Weir feed water heater and different lubricators. The feed water pump was fitted to No. 359 in 1914 and removed in about 1919. Both Wakefield mechanical lubricators and Detroit No. 5A hydrostatic lubricators were fitted to varying members of the class, and four engines were still fitted with Detroit lubricators when they were withdrawn. Full superheating of the D29 'Scotts' did not start until the 1920s. Both the NBR and the LNER chose to only fit superheated boilers to the D29s after the original saturated boilers had reached the end of their lives. The NBR prepared drawings for D29s fitted with Robinson superheaters in December 1922, and the first was fitted in 1925. The last D29 became superheated in 1936. During this process of superheating, the saturated engines were known as class D29/1, and the superheated engines were known as class D29/2. The Diagram 78 boilers were interchangeable between a number of ex-NBR 4-4-0s. Although construction of new superheated Diagram 78 boilers continued until 1951, many of the 'Scotts' initially received superheated boilers taken from D30 'Superheated Scotts' and D34 'Glens'. The original NBR whistles fitted to the 'Scotts' were noted for their mellow sound, and they were operated by pressing a lever forward. The LNER fitted standard whistle gear which was operated with spring-loaded pendant handles on either side of the cab roof. The springs would weaken over time, resulting in a continuous "toot-toot-toot" sound when the locomotive was running. The D29 'Scotts' were initially used for the express passenger services from Edinburgh to Carlisle, Aberdeen, Perth, and Glasgow. Many of these duties changed with World War One, including an end to the non-stop Carlisle services. However, they continued to give good service working alongside the D30 'Superheated Scotts' and D34 'Glens'. By Grouping (1923), the D29s were still being used on a number of express services, although they also began to see work on stopping trains. During the 1920s, they could often be seen hauling fish trains to Dundee, and piloting C10/C11 Atlantics on the heaviest of loads. As the D11 'Improved Directors' and D49 'Shires' entered service, the 'Scotts' tended to be displaced to country sheds. During the 1930s, a typical allocation was: Dundee (3), Carlisle (3), Hawick (2), St. Margaret's (2), Aberdeen (2), Haymarket (1), Thornton (1), Stirling (1), and Dunfermline (1). By this point, the D29s were mainly relegated to stopping services. All of the D29s were superheated by 1936, and in theory had a greater tractive effort than the D30 'Superheated Scotts' due to their slightly higher boiler pressure. Hence, they were often used for special trains such as football specials through Glasgow, or Sunday excursions to Whitley Bay. Rob Roy and Redgauntlet were particularly popular locomotives for these specials. The D29s were mainly used on stopping services during the 1940s, but the tightly-timed 4:10am newspaper express to Hawick was a notable exception. The new Thompson B1s were a natural replacement for the D29s. Withdrawals started in February 1946, but twelve survived into BR ownership (1948). The last D29 'Scott' was withdrawn in November 1952. Heating Surface: Total: 1618.12 sq.ft. The last D29 was withdrawn in 1952, and none have survived into preservation. 4mm scale (OO gauge) kits of the D29 are available from both Gem and PDK. NB Models also produce a D29 kit for 7mm scale (O gauge). Reid re-introduced the policy of renaming NBR locomotives, and both the D29s & D30s were given names associated with the literary works of Sir Walter Scott. This theme resulting in both classes being known as the "Scotts". No. 2403 Sir Walter Scott was given special prominence due to its nameplate being rendered in uppercase as SIR WALTER SCOTT. Due to a mistake at Cowlairs Works, No. 2403 Sir Walter Scott actually ran as Jeanie Deans for three weeks in January and February 1947. Thank you to David Henderson for the photograph of the superheated D29/2 Dandie Dinmont.